The Giardia test checks for Giardia lamblia antigen in the stool and helps check for an infection. What type of Giardia test is this? This Giardia test is a Giardia stool antigen test. Why is a Giardia stool test important? This Giardia test helps screen people with unexplained intestinal symptoms, particularly after camping. This Giardia Test is a stool test. The Giardia test, sometimes known as a Giardia lab test, Giardia stool test, and Giardia ag test, checks for the presence of Giardia antigen in the stool. Giardia is a type of parasite known as a parasitic protozoan that causes gastrointestinal infections after one ingests contaminated water or food. Giardia infections are classically known as causing symptoms after one has gone camping or backpacking. Once Giardia settles into the intestines, symptoms typically start within two days. A Giardia infection can cause lots of problems in the gastrointestinal system, including smelly and violent diarrhea, cramping with nausea, constipation, bloating and gas. Untreated, symptoms can last for up to six weeks and can cause excessive water loss. Longer term, a Giardia infection can lead to giardiasis, a disease that results in malabsorption from damage to the intestinal tract. 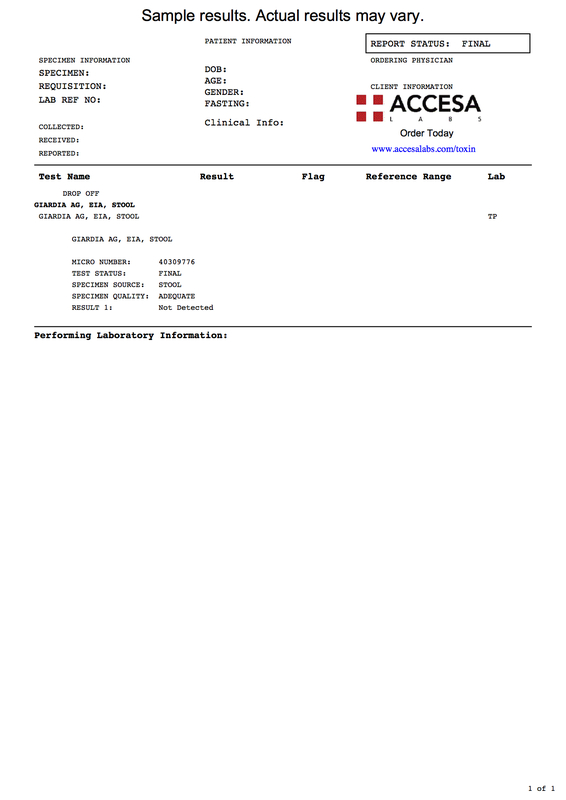 This Giardia antigen test analyzes the stool for the presence of Giardia antigens. This Giardia stool test requires at least 5 grams or mL of stool which can be provided at the lab location. To get a Giardia test near you at Quest Diagnostics, simply order online and submit your stool at the selected lab on the day of testing. As can be seen on the sample Giardia lab report, a not detected result will be reported if no Giardia is detected. The Giardia test is a component of the infection panel test which screens for a wider range of infections. Giardia Test at Guaranteed Prices.